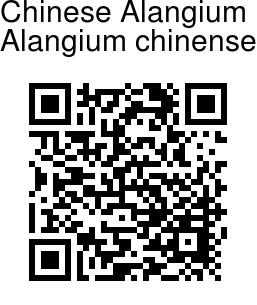 Chinese Alangium is a shrub or small tree, 3-5 m tall. Branchlets are velvet-hairy when young, becoming hairless. Leaf-stalk is reddish, 4-6 cm; leaf blade ovate or round to heart-shaped, 8-20 x 5-12 cm, below clustered velvet-hairy at axils of veins, above hairless, strongly 3-5-veined at base, base usually oblique, occasionally rounded or nearly rounded, or triangular, margin entire or with few shallow lobes, tip tapering. Flowers are borne in leaf-axils, in 3-15-flowered cymes. Flowers are about 2 cm. Sepals are 4-7, shortly toothed. 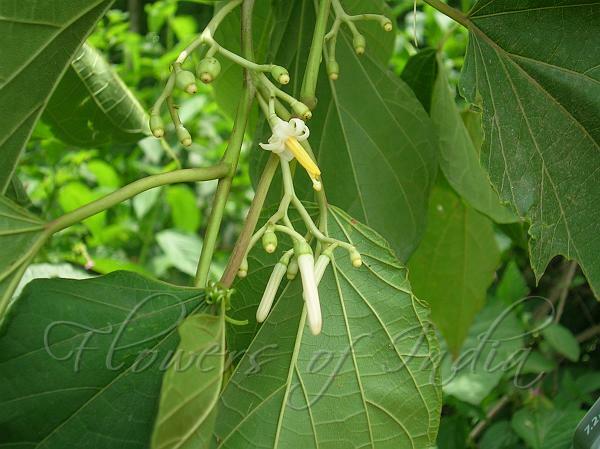 Petals are valvate, 6-8, lanceshaped, 1-1.5 cm. Stamens are 6-8, about as many as petals, hairless. Drupe is ovoid, 5-7 mm, seed 1. Chinese Alangium is found in the Himalayas, in forests, forest margins, exposed places, at altitudes up to 2500 m, from Nepal to Bhutan, Burma, east to China, Malaysia, and also E Africa. Flowering: May-July, September-October.